TheWoodHaven2 • View topic - Trimble Towers Workshop - Organisation. Trimble Towers Workshop - Organisation. Roll up, roll up. Here you will find everything from new workshop designs, through builds to completed workshop tours. All magnificently overseen by our own Mike G and his tremendously thorough 'Shed' design and generous advice. Re: Trimble Towers Workshop Build - What? Is that progress. Singles in conduit + 25mm is the way to go but I cant think for life of me why he would do it in drops ! Each to their own and must have his reasons. Very nice job. jules70 wrote: Singles in conduit + 25mm is the way to go but I cant think for life of me why he would do it in drops ! Each to their own and must have his reasons. Very nice job. Really don’t know mate. So long as it works and is compliant (and means I can get in ASAP) then I’m happy. My sparks did my wiring the same way as Mark's...trunking and drops. Seems to me having all those drops will get in the way of hanging cupboards, as well as a waste of cable. At this rate there will be sawdust long before Christmas! The clean up near the tank is a nice solution, pity about the washline. Phil wrote: Nice progress Mark. The washing lines are retractable and hidden away when not in use. They were wash days when the photos were taken. Well there's one I've caught up with ! I bet the closer it gets , the more you want it done so you can get in there ! Well life is no less busy but I’ve reprioritised some things in my life lately and am starting to make time for things for me! 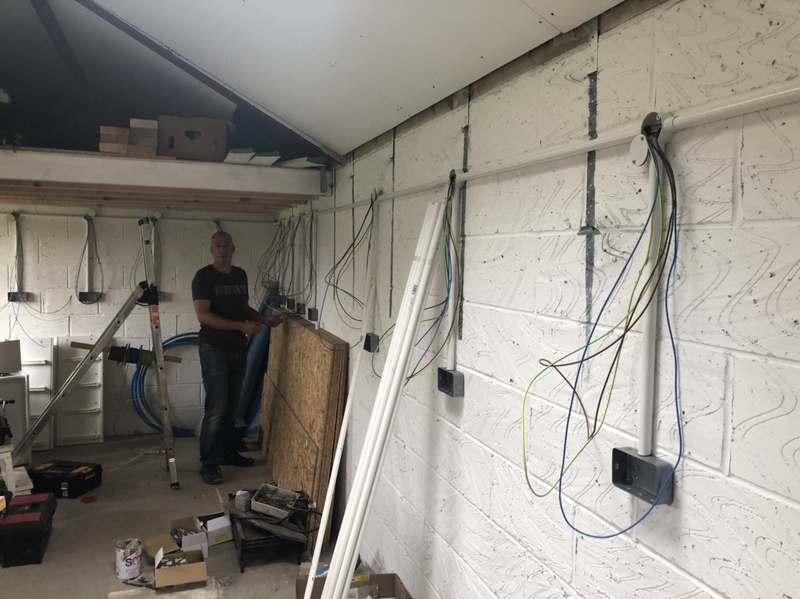 My mate took Friday off to do some more on the electrics for me so we cracked on together and got the remaining conduit in place for the sockets round 3 sides, all the singles pulled through and 6 sockets terminated. He care round again today for a couple of hours and we drilled through into the house and terminated into the main consumer unit so we now have a live CU in the workshop!! We’re going to get a couple more hours at it in evenings this week and get the sockets livened up. 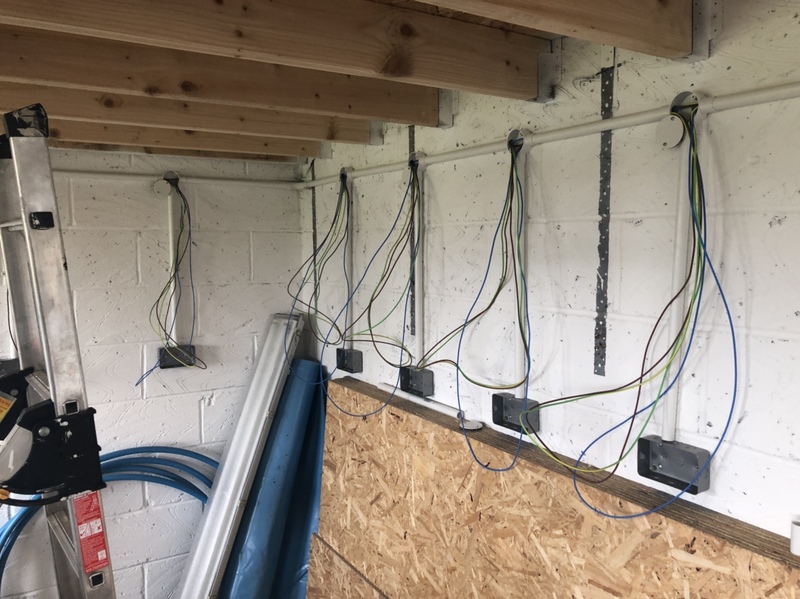 Still to go is a bit more conduit for sockets along the front wall, lighting circuits and a couple of external lights and sockets then I can get it signed off. I am having the flat panels as the main lighting but in the handtool section I think I need tubes up in between the mezzanine rafters so can anyone recommend some for me, both fittings and tubes, so I don’t need to research? The panels are 6500k LED so the tubes need to compliment these. I was worried, do you think I’ve gone too few? Why do you need a different type of light to use hand tools? Hand tools are not something that happens in my shop** but is there a difference required? A semi serious reply. I use trad fluorescent tubes and each time I've wondered about leds, I keep coming back to the reliability of the drivers and then we have poor malcolm's experience of severe RFI. My network connection down there is via homeplug at near limit range. No mate it’s nothing to do with hand tools, it’s just because having the flat panels against the underside of the joists means I will be in danger of belting them as I move stuff around. I thought it would be safer to have tubes up in between a couple of sets of joists that I could recess up slightly above the joist bottoms. Well it is progress so keep it up. Still don't understand why you have wasted so much cable and conduit on all those vertical drops. The horizontals should be in line with the sockets. But I could be wrong. Andyp wrote: Well it is progress so keep it up. I asked my sparks why he'd done my workshop the same way and TBH his answer didn't make sense. I think it's a question of 'because I've always done it that way'. Actually, daylight is a great thing. I took great care giving my boxes a first coat of thin varnish working in the shop with lots of lighting on ( none flicker double daylight fl. tubes) But examining them later in daylight when dry I was really surprised how much I’d missed. Came as a bit of a shock - you cannot have too much lighting never mind plug sockets! Yeah defo pop in Roger. I’ll be home all day apart from School drop off and pick up (out between 14:45 - 15:30. Firstly, I've never regretted having 24 double sockets. Each time I do something that needs plugging in, I have a choice and don't have to stretch. Secondly, could 600 x 300 or 1200 x 300 panels fit between the joists? Question, I'm just buying some more MCB's for the shop and looking at the ratings. I would think that MCB B's would be more than enough for the shop, but has anyone installed C's for any particular machines or applications? I imagine the only 3 machines in my shop with enough possible grunt to trip a standard 13a socket would be the tablesaw (which ran fine on a 13a plug when the shop was in the house, so can't see it being any different, but I might put it on a 16a commando and matching MCB just in case, the planer/thicknesser and the DX. All the above worked fine on 13a in the garage workshop but happy to take any advice now before I purchase. If they worked fine before then they should still be OK on those B breakers. I have two separate 16a radials and use the table saw on one and DX on the other. I believe they're on Cs. My DEFT tablesaw is on a C with 16A plugs. But everything else is as “normal”. I feed my workshop with a C40 breaker in the house and avoid nuisance trips in the workshop itself by having wired fuses in recycled CUs from the house when I re-wired it. These are tolerant of motor start ups but will blow in the good old fashioned way for serious fault protection. Not this is likely to be an option for you Mark for signed off installation. I would fit C breakers for any serious motor loads. Even my 1.5hp planer will take out 13amp cartridge fuses and B16s. Motors are very variable as to whether they will take out 13amp plug fuses or low rated breakers so I would say use 16amp sockets with C breakers just in case. OK all understood on the hand tool lighting issue. Yes keeping them from harms way is sensible but too deeply recessed could create shadows. Regarding doing drops, if you've tall furniture that needs to go against the wall it is easier to remove a drop to make space than it is to reroute dado trunking. Looks like you will make the Xmas saw-dust deadline comfortably?